This is a very rare and important find. It is a spiny Archaeocidaris illinoisensis from the Mississippian of St. Louis. Fossil echinoids from the St. Louis area are famous around the world and have been extremely sought-after by collectors for decades. These urchins were found YEARS ago, stored in a box, and just now opened and prepared - when they're all gone, they're GONE! These spiny urchins are larger than the Lepidocidaris found in the Mississippian Warsaw Formation, and are OLDER than the Pennsylvanian Archaeocidaris from Texas. This urchin has MANY barbed spines still intact. Most of the types of urchins from this site have smooth spines (there are three species! ), and ones with the barbed spines are rare. 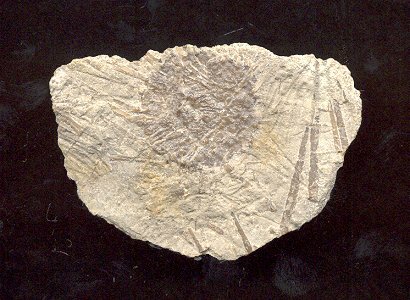 The echinoid displays beautifully on the natural plate of matrix. This is a very distinct example of Archaeocidaris illinoisensis from the St. Louis Formation, offered exclusively through EXTINCTIONS.